When it comes to catching my attention lyrically, there are few emcees that have the same effect on me as RAKIM. I'm not sure if transfixed or mesmerised are the best adjectives to use, but I'm pretty much in a hypnotic state when RAKIM is on the mic. I have yet to hear another emcee impress me as much as he did in July '86 when "Eric B for President" dropped on ZAKIA. I played it so much that summer I practically wore the damn grooves off the vinyl! To this day it is still one of my favourite pieces of plastic. As many of you will know, that track was destined for a certain FREDDIE FOXXX, who couldn't make the recording session, which left the mic honours to RA. I'm sure that if FREDDIE had made that session, RAKIM would still have come to our attention through other means. An emcee with skills like his would never have been left undiscovered. But thanks to FREDDIE's busy schedule (or whatever excuse he had) our ears were truly blessed that summer. There has been many sound-a-likes of RA but there have been very few who came close. His rhyme patterns and style of delivery are unquantifiable in words, and that's why he is every emcee's favourite emcee. You only have to watch "A GREAT DAY IN HIP HOP" to know that. Do you recall MOS DEF being lost for words whilst in the presence of the GOD and a certain SLICK RICK? (incidentally the RICKSTER is my 2nd favourite man on the microphone). Peep these videos of the man himself. If you know a better emcee then please lemme know (although you won't change my mind). Thanks and props to NORMSKI for the photo. 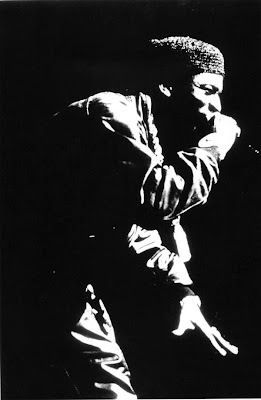 Yes DynO, THE GOD RAKIM, the best that EVER rocked the mic. That guy is incredible & i`m sure is no.1 in most peoples list of greatest MC`s. I`d love to hear those `demo tapes` that BOBBITO has stashed away of RAKIM before he blew up. Now i wouldn`t mind some of that action on `limited edition` vinyl one day...! I pray the new album is quality 'R' material. Will the beats be on-point? Allah gave you a shout on Pump It Up?!!!! Props Hope you guys are all good. Great blog as always.